Johnson County Adult Education helps adult learners learn basic reading, writing, math and everyday survival skills, and prepare for the GED® test. Johnson County Adult Education (JCAE) helps individuals age 16 and older who are no longer in school gain basic skills in reading, writing, math and everyday survival. Their dedicated staff and team of volunteers help students prepare for the General Education Development (GED®) test and they work with individual students to create a personalized study plan to help them meet their educational goals. Class sizes are small, which helps ensure students receive individualized, one-on-one attention. Earning a Kansas state high school diploma opens doors. You will have opportunities available to you like entering directly into the workforce to more responsible, better-paying jobs; or you may choose to continue your education and enroll in college classes. Whether you speak little or no English, JCCC offers free English as a Second Language classes at your level. 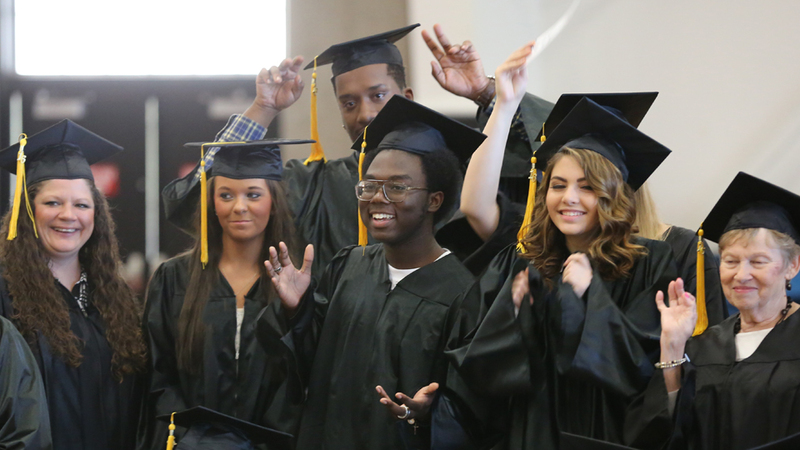 These students' tomorrows took off from JCCC, and so can yours. Caring counselors offered encouragement and a plan for my future. They were there when I was close to giving up. Jump in head first. Go for it. Don't let anything hold you back. I actually like learning! Five years ago I didn't have the drive. Now I want more. The more I have, the more I can give back. Have confidence. You are good enough. They believe in you. The JCAE transition coaches are there to help with a plan for college and financing it. Scholarships and grants are out there to help you.